WHAT?!!! She disturbed your NAP to take a picture? We'd be grumpy, too! You look beautiful though, as always. Have a fabulous weekend, Athena. Gorgeous selfie, you are a beautiful girl. 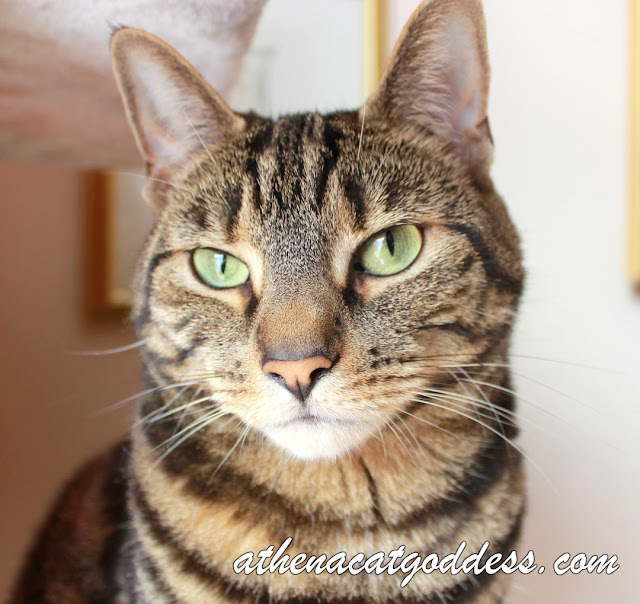 I think you look more solemn than grumpy, Athena. Nice photo! Wes missed posting on your Artsy Caturday as wes had visitors, wes will be back next week! You always take a beautiful portrait Athena. She's right you know you ARE!!!! Dis you see Mudpie'ss selfie?? Shee looks wist full all so....Must bee sumfin inn thee air! We love your selfie, Athena. Your mum is right, you always take lovely selfies. You always look beautiful, even if you feel a little grumpy. You are definitely a natural! Beautiful!